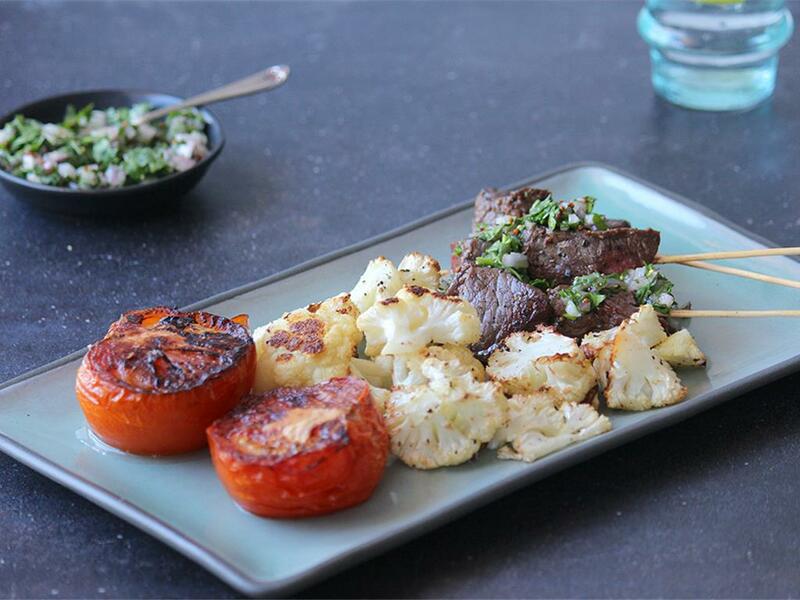 Beef skewers served with roast tomatoes & cauliflower & a fresh herb mustard salsa. Herby salsa: Mix together the coriander, parsley, red onion, garlic, red wine vinegar and HALF the wholegrain mustard. Season with salt and pepper and whisk in the olive oil (2 tbsp for 4; 1 tbsp for 2). Tomato & cauliflower: Place a pan on high heat with a drizzle of olive oil. Brown the tomatoes, skin side down for 1-2 minutes until slightly charred. Remove and place on a tin foil lined baking tray with the cauliflower florets. Drizzle with olive oil, season with salt and pepper and roast for 12-15 minutes until golden and cooked. Beef skewers: Place a pan on medium-high heat. Toss the beef cubes in a little olive oil and thread them onto the skewers. When the pan is hot, add the skewers and fry for 8-10 minutes, turning occasionally until brown all over, but still slightly pink inside. Serve the skewers with the roast veg on the side, topped with the herby salsa.